This was my first time making this dish and I must say that it was a major success! For some reason, my experiments turn out to be my best lol. Maybe it’s because I allow myself to not care as much about how it turns out. No pressure, right?? I actually was inspired to make this by looking on Pinterest and I saw a pin that had a white fish rolled around some sort of filling. I was like…who knew you could do that? After all of the cooking I have done, you would think I would have learned that technique by now. I’m telling you, when it comes to cooking, you learn something new everyday! After some searching for different stuffed white fish recipes, I decided to combine spinach and feta to give this a Mediterranean feel. To top it off, I gave it a little crunch by coating in seasoned breadcrumbs. Preheat oven to 350F. Drain spinach and squeeze out all liquid using paper towels or a dishtowel. Heat butter and olive oil in a small skillet set to medium-high heat. Add onion and sauté for 2 minutes. Add garlic and sauté until onions are translucent (another 2-3 mins). Place spinach, onion mixture, feta, ½ tsp salt, and ½ tsp pepper in a small mixing bowl and stir to combine. Spread breadcrumbs out on a flat dish. Lay all four filets on top of breadcrumbs. Season exposed side of fish with remaining salt and pepper. 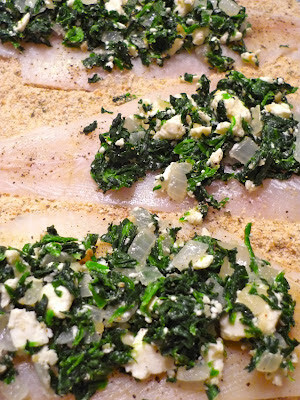 Spoon 2-3 tbsp of spinach mixture onto fish and roll each filet around the filling. Place each roll into a square baking dish, coated with cooking spray. Note: You can either buy seasoned breadcrumbs or you can season them yourself. For this recipe, I seasoned plain breadcrumbs with Parmesan, Italian seasoning, salt, and pepper. Spray the tops of each roll with cooking spray and cook at 350F for 20 mins. If breadcrumbs are not browned at this time, turn on the broiler for a few minutes until breadcrumbs brown slightly. Remove from oven and serve immediately. Garnish with lemon. Tip: For dishes that cook quickly and you have a breadcrumb topping, spraying the topping with cooking spray allows them to brown and get crispy in a shorter period of time. To complete this entrée, I served the stuffed sole over lemon & Parmesan orzo with chopped parsley. The entire meal was fresh, light, and healthy and I can’t wait to make it again. Now that I know how to use this technique, I’m looking forward to playing with many different types of stuffing mixtures. If you can think of any interesting combinations, be sure to let us know!